It’s that time of the year – Wookie Life Day! Or Christmas, or Hanukkah, or Kwanzaa…but whatever you’re celebrating this holiday season, there are some mighty fine gifts for the Star Wars fan in your life. There are probably plenty more where this came from, but these are my five best Star Wars gifts ranging from the relatively inexpensive to the extravagant! Let me know what your favorite Star Wars gifts for 2017 are. Sphero Droids – Whether you’re a fan of the Dark Side or the Light, Sphero has a droid for you. Three different models are available and act as real life versions of what you see in the films. The ever-cute BB-8 comes rolling to your house and is sized relative to the equally cute and functional R2-D2 (I love the extendable third leg which you almost never see). And for those looking forward to The Last Jedi a new nemesis in the form of BB-9E looks like an evil BB-8. The remote control functions for these droids are easy to understand and have great range. A bit pricey, but about the best remote control droids you’ve ever seen. Sphero retails them for $99.99 for BB-8 and $129.99 for either R2-D2 or BB-9E. Thrawn was not only highly anticipated but delivered! Star Wars Books – You can’t go wrong with Star Wars books! As revered as the movies for Star Wars universe canon, there are so many awesome selections it’s hard to choose. Next week, I’ll have an entire post on just the five best Star Wars books, but they had to be included among the best gifts. Probably the most highly anticipated of them all is From A Certain Point of View which retells the classic original Star Wars film from the perspective of 40 minor characters written by 4o different authors. The audiobook is also great and has some stellar actors like Jon Hamm as Boba Fett and Neil Patrick Harris as an Imperial officer. Ashley Eckstein lends her voice to one of the stories also and there are so many others. Thrawn had to be my favorite of the year, though. Just an incredible story. But others like Leia: Princess of Aldreraan, Phasma, and Inferno Squad are all out there and there is one that will surely meet the Star Wars lovers heart. Star Wars: Secrets of the Empire – Have you ever wanted to LIVE Star Wars? You’ll have your chance with the new VR+ Star Wars: Secrets of the Empire. More than just VR, you interact as a team in this immersive experience which puts you in the heart of the action. You can BE part of the Star Wars universe! You can buy tickets in advance right now for only $29.95 through The Void’s website, but they only have three locations you can take part in this event – Disney Springs in Orlando, Downtown Disney in Anaheim, and in the United Kingdom. If you know someone who already lives and breathes Star Wars, now they can for real! Star Wars LEGO – I don’t know of any Star Wars fans who don’t also love LEGO. Not to say they don’t exist, but these highly popular sets are almost sure to be a hit among Star Wars collectors. These two brands have a long and beloved history together, and the new sets are sure to be a hit – especially the ones based on The Last Jedi! These range in price from the adorable $9.99 Microfighters to $799.99 for the out of stock Ultimate Millennium Falcon (the largest LEGO set ever made). One of the most popular is sure to be the First Order Star Destroyer or the Resistance Bomber. You can order direct from LEGO and earn those VIP points or buy them in your local store. Star Wars Day At Sea – For those wanting to give an extravagant gift, a trip on the Disney Cruise Line during January to April of 2018 would be perfect! 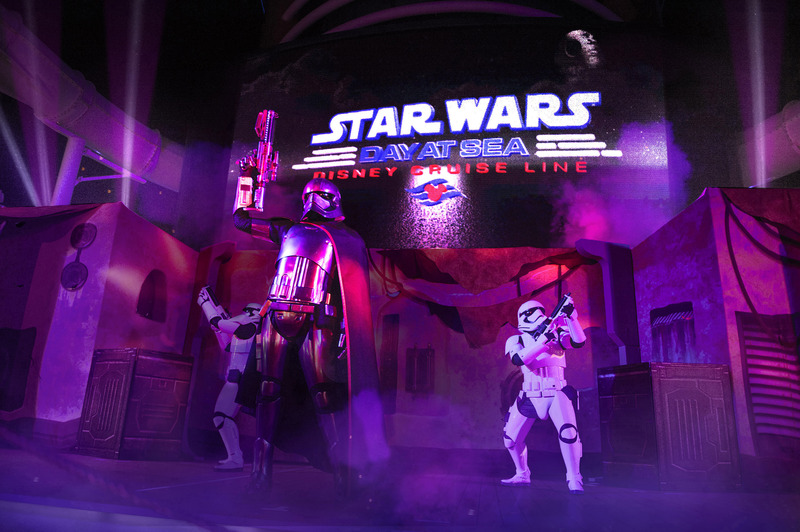 On select cruises on the Disney Fantasy, they will host Star Wars Day at Sea filled with Star Wars experiences from top to bottom all day long. Unique food and beverages, activities, movies, and of course a Star Wars themed deck party complete with fireworks is planned for the occasion and they usually have special merchandise for these cruises as well. Photo ops and character encounters, especially for the kids, are in abundance. Costs depend on a variety of factors, but it isn’t cheap – it’s just worth it. Hopefully, this will help you in trying to choose the perfect Star Wars gift for that special someone!